Abu Dhabi, UAE – 12 June 2018: The Department of Culture and Tourism – Abu Dhabi (DCT Abu Dhabi) in association with the Department of Economic Development of Abu Dhabi (DED) has announced a 24-hour mall mega sale, featuring discounts of up to 90 per cent, as part of this year’s Eid Fest celebrations. With more than 1500 stores involved, the sale will kick off at 10am on Friday, June 15th and run until 10am on Saturday, June 16th bringing families and friends from across the region and beyond to Abu Dhabi to celebrate this special occasion. Inspired by the runaway success of last year’s Mega Sale at Yas Mall, 15 malls will be participating in this year’s unique super sale. Malls participating include World Trade Centre (WTC) Mall, Al Jimi Mall, Dalma Mall, Marina Mall, Mushrif Mall, Khalidiya Mall, Al Wadha Mall, Mezyad Mall, Barari Outlet Mall, Fouah Mall, Al Raha Mall, Madinat Zayed Shopping Centre and Souq Centre, Bawadi Mall, Hili Mall and Yas Mall. At Yas Mall alone, there will be more than 300 stores open around the clock on June 15 with a combination of exclusive offers, contests and activities. The shopping bonanza will also feature a diverse line-up of events as well as various activities at malls and venues across the emirate such as the delightful live performance with Pinkfong and Baby Shark with Teacher and their dancing friends in an interactive sing and dance concert in Bawadi Mall in Al Ain, designed to offer memorable moments for families, residents and visitors of all ages to enjoy. 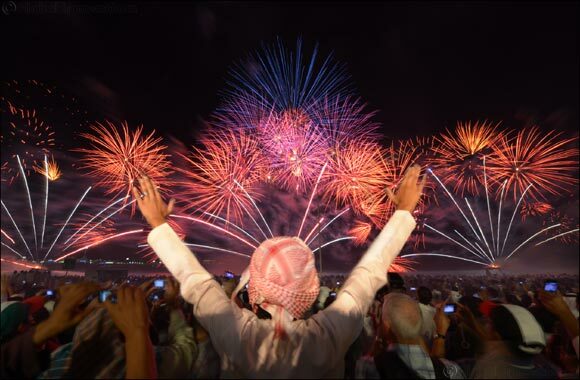 In addition, Abu Dhabi will be marking the first day of Eid Al Fitr with dazzling fireworks display that will light up the sky on Friday, June 15th at 9pm at Abu Dhabi Corniche and Hazza bin Zayed stadium in Al Ain. Yas Island has also announced an exciting programme of celebrations taking place across the Island during Eid Al Fitr. The UAE’s premier entertainment destination will host its very own thrilling three-day fireworks extravaganza, with a daily fireworks display kicking off at 9pm every night during Eid that can best be seen from the Yas Marina promenade or on board a traditional dhow with Captain Tony’s Eid Fireworks Fun Cruise for a truly memorable experience. Families can also head to Yas Marina from 7 pm to enjoy a selection of engaging carnival games and explore the night market. Visitors can also enjoy the festive atmosphere in air-conditioned comfort from one of Yas Marina’s many restaurant terraces. Meanwhile, Ferrari World Abu Dhabi will get into the Eid mood by keeping its doors open for 24 hours. On June 15, guests will enjoy the head-spinning 24-Hour Rollercoaster Rally, featuring loads of shows, games and DJ music inspired from the iconic decades of the 50s through to the 90s. Park guests can also enjoy free entry to the theme park after 6 pm on that day, and pay as they go for the ride packages they choose. Celebrating Eid Al Fitr with a giant splash, Yas Waterworld will open a new attraction that’s a first for the UAE, Cinesplash. The all-new 5D water adventure will take guests on an interactive journey that simulates effects including spraying water, water explosions, rain, waterfalls, and much more. Guests during Eid will also enjoy a dose of culture with the traditional Ayyala performances, as well as ornate henna painting and Arabic ‘gahwa’ (coffee) with dates. Visitors looking to enjoy all of the exciting activities on offer during Eid Al Fitr can make the most of their visit by staying at any of Yas Island’s seven hotels. Those staycationing on Yas Island will be able to triple the fun with complimentary tickets to Ferrari World Abu Dhabi and Yas Waterworld, as well as Yas Beach.